As we now head into the cooler weather you may find that your hair (and skin) is starting to feel a bit dry due to the lack of moisture in the air. Before this colder weather causes more extreme dryness or hair damage, it is time to take control! When the weather turns cool there is nothing that feels better sometimes than a hot shower. That said, hot water can really dry out the hair and the skin. Next time you shower, turn the temperature to just lukewarm to wash your hair and then use cool water to rinse both the shampoo and conditioner from your hair. If you can’t bear not to use hot water at all during your shower, do so as a reward for a few seconds at the beginning or end of your shower. A shortened duration of hot water will save both your hair and skin! The cooler weather usually means your hair can stay cleaner longer. Take advantage of this fact by trying to shampoo less often. For those frequent hair washers out there just remember…both dermatologists and stylists agree that there is no reason to shampoo every day. Mix 1 beaten egg with 1 teaspoon of avocado oil. Apply to full lengths of your hair, starting at ends. Let mask sit for 15 minutes and then rinse thoroughly. Shiny, bouncy hair will be yours! 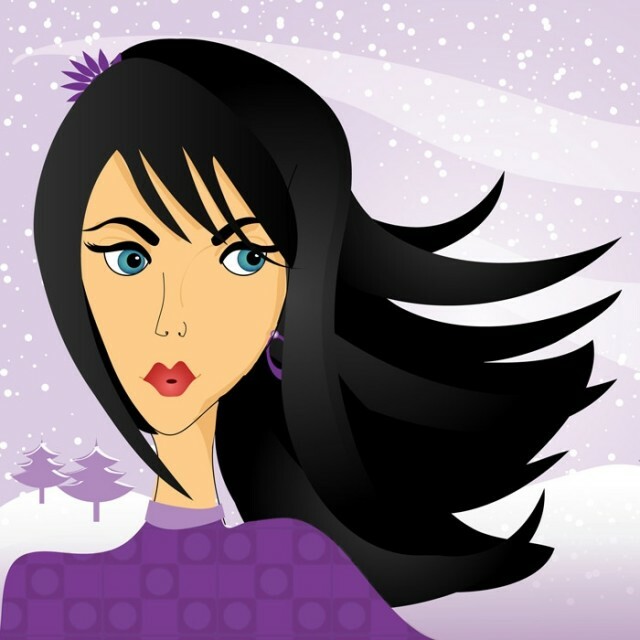 Dry fall and winter weather can also lead to split ends. One way to easily prevent split ends is to apply a tiny bit of natural oil to your ends every night before bedtime. Just pour a bit of oil on your fingertips and then massage into ends. In the morning your ends will be shiny and happy. Good natural oils to try include argan oil, sweet almond oil, coconut oil or olive oil. As many of you now know, shampoos with sulfates are typically harsher on the hair, especially textured hair. Look for shampoos that specifically state they are sulfate-free and read labels! The major sulfates to look for on product labels include Sodium Lauryl Sulfate (SLS), Sodium Laureth Sulfate (SLES), Ammonium Lauryl Sulfate (ALS), Ammonium Laureth Sulfate (ALES). The last thing your hair needs is to be exposed to really cold air, so make sure to grab a hat before you head out in the cold. Wearing a hat is not only a proven way to keep your body warmer, but it will also protect your hair from really drying out. The typical cotton pillowcase removes moisture from your hair and can cause tangles, breakage and frizz due to friction. Solution? Buy a satin or silk pillowcase. Not only are they better for your hair, they are also better for your skin! Also avoid excessive dryness and damage in the dry, cold weather by adding more time between your hair coloring appointments or chemical treatments. If possible, increase your regular appointments to every 8 weeks or longer. Overuse of your flat iron or curling iron is one of your quickest routes to dry, damaged hair. And, when the air is dry those trusty hot tools can do damage even sooner. That said, this is the perfect time of year to give your hair a break from heat styling appliances. In the end, your hair will look better for it! As much as this sounds like a no-brainer, there are many of us that do this when they are running late in the morning. Why is it so bad? If the air is at a freezing temperature the water left in your hair can also freeze, making it possible for your hair to just snap and break off!